Sookju namul, or Korean mung bean sprout salad, is one of the most popular side dishes you're likely to find in Korea. It has numerous advantages over other dishes. It's fresh, delicious, healthy, and (perhaps most importantly) it's easy to make. It also can complement almost any Korean meal. In fact, it's not unusual to find Korean bean sprouts as an ingredient in bibimbap (Korean mixed rice with vegetables and meat) or served alongside the popular daikon radish and carrot salad. You also can stir these bean sprouts into soup or simply use them as a side dish with rice. While some people argue that uncooked bean sprouts provide a better crunch, Korean bean sprouts traditionally are blanched in boiling water just long enough to cook them slightly, but not long enough to make them mushy and unpalatable. Watch your bean sprouts closely and don't get distracted, since even an extra 30 seconds of parboiling can destroy their crispness. Parboil bean sprouts in boiling water for 2 minutes. 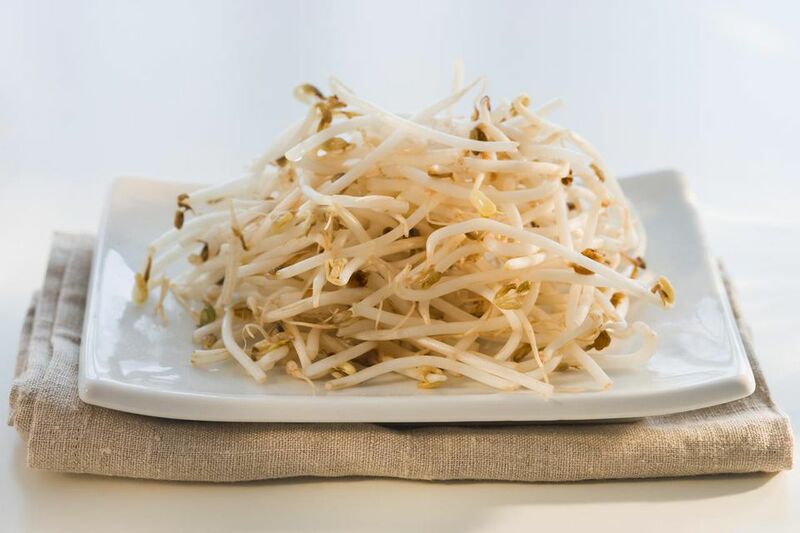 Squeeze bean sprouts between your hands to get rid of excess water. Toss the bean sprouts with all of the seasoning ingredients and serve immediately or refrigerate. Bean sprouts spoil quickly, so unlike many other Korean sides, this dish cannot be kept for a long time in the refrigerator. Mung beans, traditionally used as Korean bean sprouts, are high in several essential trace minerals, including manganese, zinc, and magnesium. They're also a good source of folate and other B vitamins, such as niacin, pantothenic acid, and vitamin B6. It's possible to buy sprouted mung beans for this salad in Asian markets that sell fresh produce, or even online. But if you can't locate the sprouted beans you want, it's also a fairly simple matter to sprout them yourself, even without a dedicated sprout maker. It only takes about two to three days to grow sprouts from mung beans—just be certain you purchase beans that are intended for sprouting. It's also possible to use other sprouted beans for your Korean bean salad. Sprouted soybeans are commonly used, although you will need to blanch them longer than your mung bean sprouts (four to five minutes, as opposed to two minutes). However, you may find the best Korean bean salad is made with mung bean sprouts, which perfectly complement the light sesame, garlic, and scallion sauce.